Here are the Free Health Workshops for your selection. You can choose your preferred workshop and engage us to conduct the workshop at your venue- schools, corporate companies, organizations, events (within Singapore). The free workshops are also conducted at WfLC for everyone to join at their convenience.
. Posture & Ergonomics- Don’t let them destroy your life; improve them to increase work/school productivity.
. How To Boost Your Immune system- Stay healthy even when everyone is sick.
. Pain Management Without Medication- Headaches, back pain, joint pain etc.
. Pain, Inflammation & Healing Foods- Food is your best medicine from nature.
. The Real Truth Behind Prescription Drugs- Over-reliance on drugs we don’t even need.
. Your Kid Is Not Stupid- A neglected key (in health) to unlock the smarter kid within. To highlight the importance of adopting proper posture and ergonomics at work. How poor posture and ergonomics can damage one’s health and work productivity; especially for those suffering from neck/shoulder/back problems. How Chiropractic is related and how it can help. Stretches, lifestyle modifications and other solutions to improve posture and ergonomics at work.
. Fight The Flab & Get Fit- Simple DIY workout circuit to do anywhere. Get toned & strengthen the core for spinal support.
. Yoga and Stretches For Spinal Health- Practical stretches and basic Yoga moves to relieve and prevent back pain. We use safe and non-invasive scanning device to detect muscle tension along the spine. Usually, the area with high muscle tension indicates there’s problem around the region along the spine. The Doctor will then explain your scan results in relation to the health problems you are experiencing and offer advice or solution to manage the problems. We conduct free Spinal Scanning at various public compounds like Junction 8, Vivo City, Chevron House, Raffles Exchange, Ang Mo Kio Hub etc. on a regular basis. We can also come to your preferred location (where your organization is) to conduct the Spinal Scanning for your participants. Doctors of Chiropractic are qualified specialists in the bio-mechanics of the spine and posture care. They will know what is best when it comes to proper ergonomics. 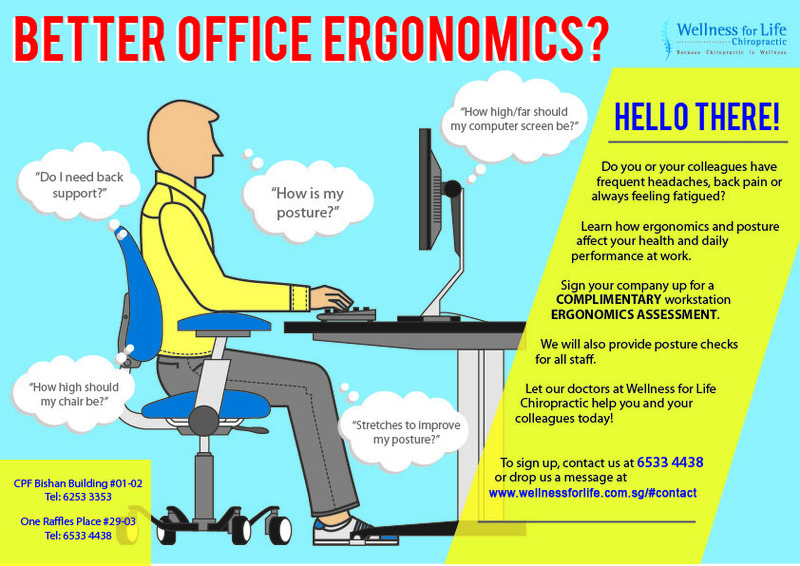 Engage our Doctors to come to your organization to conduct free posture checks for your participants and assess their workstation ergonomics. Get advice from the Doctors on what is an ideal workstation and how it can be improved ergonomically. Enter the sum of 5 + 19	below to prove you are a human.